….Til you’ve tried a wine, across every state line…. That’s right, fellow Winos! It’s the fun fact of Wine Talk Tuesday this week: Every state in our great nation makes wine! I know what you’re thinking… “Really? [in your mind, you pull up your mental map of the U.S. and start looking at all the states… Alaska?? Arizona?? Michigan??] ….No…. that just can’t be true!” But it is! Now you can’t expect to run down to your local wine shop, or even to Total Wine and be able to find a wine from every state. But if you decided to trek across the country and find local wineries selling their grape concoctions, you most certainly could do it! Click here to read Stein’s article in Time Magazine. 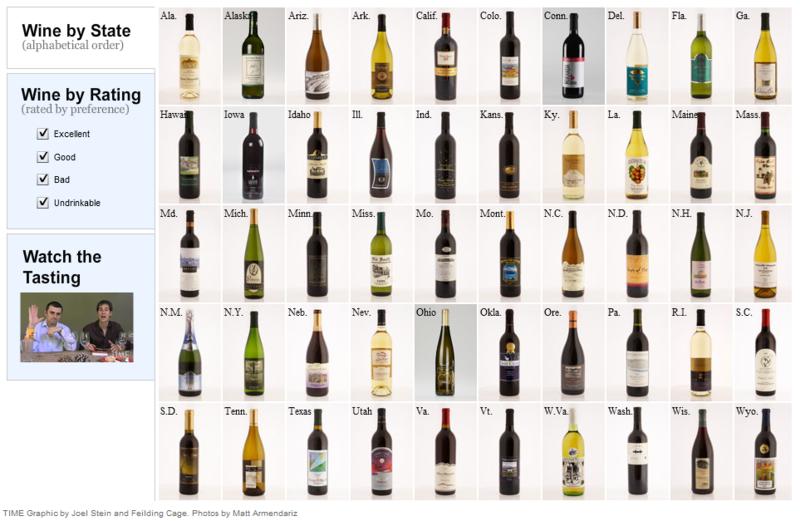 Below is a photo from the article showing one wine from each state. Fun! 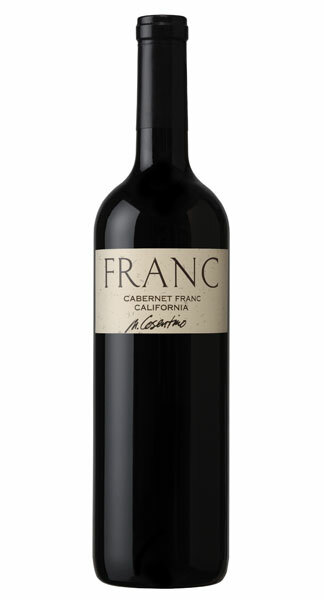 Don’t you want to taste a wine from every state!?! This Wino certainly does!! An additional note… relevant to the song that is now or soon will be, in your head for days. If you were not lucky enough to grow up singing about the Fifty Nifty United States, then you can check out this delightful video for the tune. (And I guarantee that all of those with whom I grew up STILL know the all 50 states in alphabetical order because of this patriotic delight.) I randomly picked this video from the many options on YouTube, and was happy to hear the kids shout out that Arizona is the best! While visiting a vineyard in Paso Robles recently, I was chatting with the vineyard owner. He had decided a few years back to switch one particular area of vines from Viogner grapes to Shiraz grapes, and apparently the Shiraz vines were now flourishing. 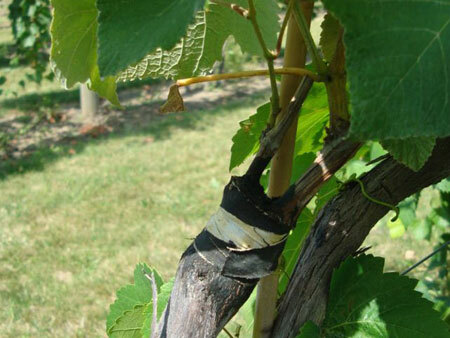 We were actually touring the vineyard and he pointed out that you could see the tape on the trunk of the vine (I’m not even sure if you call a vine’s base the “trunk” like a tree, but I’m gonna go with it for now) where the Shiraz vine was grafted into the Viogner vine. Basically, the Viogner trunk was the part growing out of the ground – the Viogner vine trunk was cut in a special way, they were smooshed together, held with a piece of tape, and voila! A year or so later, there Shiraz grapes were growing. Yes. With the base of its own plant being taped to the base of another plant. Alright. I’ll pause for all of you asphalt kids to pick up your jaw. Because that’s where my jaw was when Mr. Vineyard Owner Man told me this. I don’t care if this is common. It’s still cool. And apparently nothing new. 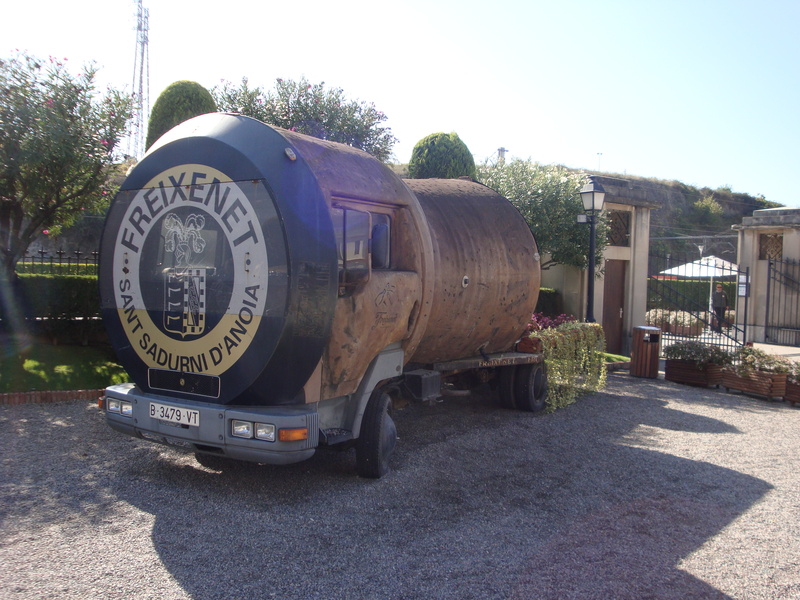 It was first referred to in the 2nd century BC, and has been an important part of wine making since the 19th century. (Why am I just now learning about this!?!) Apparently, during this time (19th century) Europeans carried back some rootstock (the base vine, or that which forms the roots of the overall plant) from North America. The North American rootstock was resistant to a phylloxera (a teeny tine vine pest), but the European vines were not. This phylloxera spread and attacked the European vines wiping out a great deal of vines across the continent. Because of this, the Europeans started grafting their vines into the North American rootstock so that their vines would be resistant to phylloxera. Choosing the rootstock is still today a very complex process, and one that should be done carefully to avoid plants susceptible to this vine critters! Anyway, how does it work?? Basically, one cuts the trunks of the two vines being grafted together like a comb or comb teeth (to put it simply), and then threads those pieces together. (The rootstock and the scion, which is the plant that you are grafting into the rootstock.) The plant tissue grows and both vines support one another. 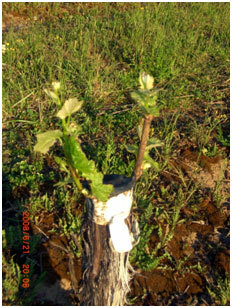 Typically, upon planting a vine, it can take several years before that plant bears fruit. But when you want, say a Shiraz vine where you have a Viogner vine, you just graft those babies together and within about a year or so, you have a plant that bears (new) fruit. While I’m amazed that this actually works, I’m also surprised that whatever vine one grafts on top of the other isn’t impacted by the characteristics of the base trunk. (Why doesn’t the Shiraz grape have a tinge of Viogner to it?) This is a point where I’ll just recognize that I am neither a Wine Know nor am I skilled in the study of horticulture and will just accept that it works for scientific reasons that I don’t currently quite grasp. There are generally two types of grafting: (1) field grafting (done by hand and in the field) and (2) bench grafting (accomplished indoors like in a nursery). What Mr. Vineyard Owner Man showed me was field grafting. Why would a grape grower want to do this? 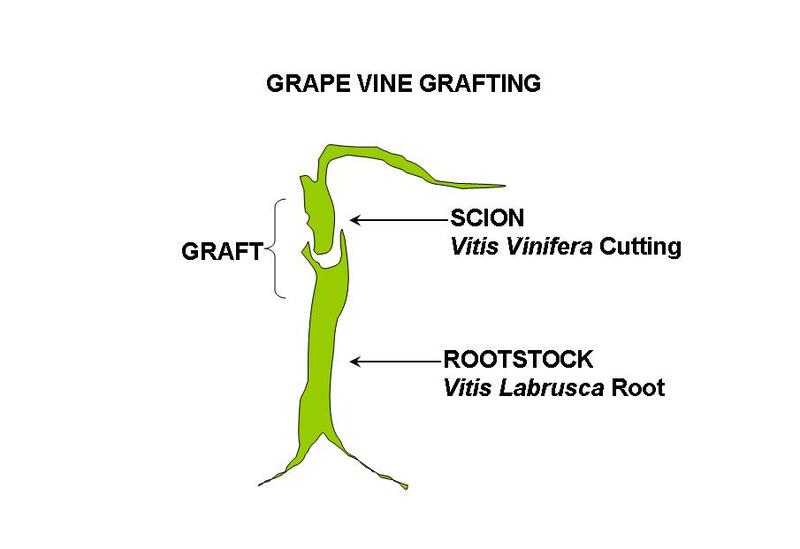 Well, when field grafting, it is simply to change up the vine varietal…. and to do it quickly. To replant vines all together is far more cumbersome and will take much more time in the long run. In addition, different types of vines are impacted by different amounts of sun, lime levels, type of soil, moisture of soil and air, temperature, etc. So the decision to change the vine varietal may be based on the (lack of) success of that vine’s growth in a given location. There is a very complicated science to how and when grafting should happen. But the fact that it happens at all – and that I know about it – makes me feel like I Wine Know a little more! I’m guessing some of you may be able to relate to this one if you had the kind of New Year’s Eve celebration that I had. (Not that I encourage such behavior…). 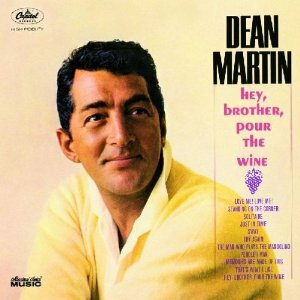 Coincidentally, my Dad performed a fantastic version of Dean Martin’s That’s Amore at karaoke over the New Year’s weekend! It must be a Dean Martin inspired kinda week. PS: I had a freshman blogging mistake earlier (clicked “publish” instead of “preview”! ), which may have caused some duplication of notifications. Sorry for any confusion! Over the next few weeks, I kept thinking about it. I loved the idea of it, but certainly felt that ever-present fear in many casual wine drinkers… “but I don’t really know anything about wine”. And hence the idea of the blog began. While I may not really know anything about wine, I do know that I really enjoy it… and I definitely want to understand it more. I shared these thoughts with a couple of great friends, one who is a Dreamer and the other an Accountabilibuddy. And between the two of them, a couple of brainstorming sessions for blog names, a little more discussion regarding the focus of the blog, and voila! Out popped Wino to Wine Know…. ….and then a couple more months went by. One day I registered this Word Press blog. Another week or two later I played around with some graphics and the layout of the blog. And then I just procrastinated for no particular reason… but today is a new day and I’m excited to launch Wino to Wine Know! I hope you join me on this journey of learning more about wine!